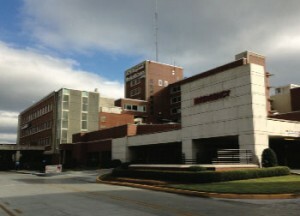 DCH Regional Medical Center is a 583-bed Regional Medical Center in Tuscaloosa, Alabama. It operates specialty units for pediatrics, orthopedics, cancer and cardiology, and the region’s most advanced trauma center and intensive care units, as well as a Bloodless Medicine and Surgery program. When the security team learned their current Casi Rusco™ Secure Perfect security management system would no longer be supported, and there was no clear upgrade path, they did not know what to do. In response, DCH Regional Medical Center, Assistant Director of Engineering Services, Shane Sanders contacted their systems integrator, Gorrie-Regan for a solution. Gorrie-Regan’s Vice President, Scott Wilson suggested AMAG Technology’s new Symmetry™ SR-Series Controller solution. The Symmetry SR series is a retrofit solution that allows customers to upgrade legacy systems without needing to completely rip out the existing system. It saves money, limits downtime and provides a solution that can grow with the hospital. The Symmetry SR Controller provided an upgrade path for their outdated system. DCH Hospital was able to reuse their 40 existing magnetic stripe card readers and their existing wiring infrastructure, saving thousands of dollars. “We swapped out the old Casi Micro 5 boards and retrofitted the existing enclosures with the SR Controller boards,” said Gorrie-Regan’s Scott Wilson. They also replaced Casi’s edge devices with AMAG’s EN-1DBC Power over Ethernet controller and installed a few Symmetry M2150 Intelligent Controllers. DCH Medical Center was able to maintain their existing user database, which eliminated the need to re-enter users. In addition, they found that when they had to enter users into their database, it was much easier to do so with their new Symmetry SR System. “The Symmetry SR system is working well and the security staff finds it easy to use; they like it a lot,” said Sanders. The security staff especially likes the graphical maps interface in the Symmetry software. To grant on the spot access, a security officer can click on the appropriate door graphic and grant access. The medical center also installed a Viking intercom system that is tied to Symmetry via alarm points. When a doctor presses the intercom, it rings a security staff phone number and the security staff opens the door. The reader at that door has an alarm input to Symmetry so a false open isn’t reported back to Symmetry. A full security staff mans the Control Center on the second floor. They carefully monitor the pharmacies, emergency room, women’s center, pediatrics, the medical intensive care unit and trauma surgical floors. They monitor all external entrances and automatically lock down everything at night except for the ER and main visitor entrance. All employees and contractors are required to wear a badge. DCH Medical Center uses OnSSI’s video system and has 255 cameras positioned inside and outside the building to monitor activity. While the system isn’t directly integrated with the Symmetry system at this time, interfaced inputs and outputs are used to call up video on the monitors, prompting quick action from security guards when necessary. A fingerprint biometric reader sits at the physician’s lounge door and provides doctors an easy way to enter the room. Cards are not needed and doctors enjoy the convenience of not needing a card to enter. Another benefit of the Symmetry system over their previous system is that Symmetry allows the security staff to group employees into smaller access groups. For example, the doctors and nurses working in the women’s center are the only staff allowed access in that area. The smaller groups help streamline the process and Symmetry makes it easier to manage their groups. New readers were installed in the operating room and pediatrics. The readers are programmed to only need a handswipe between 5 a.m. and 5 p.m. to enter. After 5 p.m., the reader switches to card and hand swipe to enter. Panic buttons are located in the emergency room, pharmacy and cash office, and are directly tied to the OnSSI video system. When a panic button is pressed, an alarm sounds and the video switches to full screen on the monitor for easy viewing. Gorrie-Regan offers a full range of parking, building and employee security solutions utilizing state-of-the-art systems tailored to a company’s specific needs. Each security system is expertly engineered, expertly installed and backed by the best service and response team in the industry. As DCH Regional Medical Center grows and adds more doors, they will continue to install AMAG readers. As the budget allows, they also plan to switch over the remaining readers and Northport Hospital to the Symmetry System. The Symmetry SR Retrofit solution provides an affordable upgrade path for them to do just that.